Lamacchia Realty announced today the launch of their new GET MORE℠ Video Campaign which will demonstrate to fellow Realtors the benefits of building their business at Lamacchia Realty. Over the summer, Lamacchia Realty filmed a series of videos where the management team and agents in the company, with varying levels of experience, discussed what the company has to offer. Anthony explained his goals and vision for the company while agents described their experiences and how the company has provided them a platform for success. The agent testimonial videos are filled with heartfelt perspectives from agents who have positively changed their businesses, and in some cases their lives, for the better since joining Lamacchia. 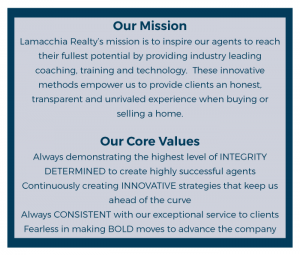 Most videos are 1-2 minutes but the first video to launch in the series is an overall corporate video which summarizes all the factors that differentiate the way Lamacchia Realty from other brokerages. Each week until the end of the year they will release two more videos including many that explain in depth the reasons why Lamacchia Agents are successful. The testimonial videos are from agents who are either new to the business or top-producing agents that have been in real estate for many years. Click here to receive an email each time a new video is released. 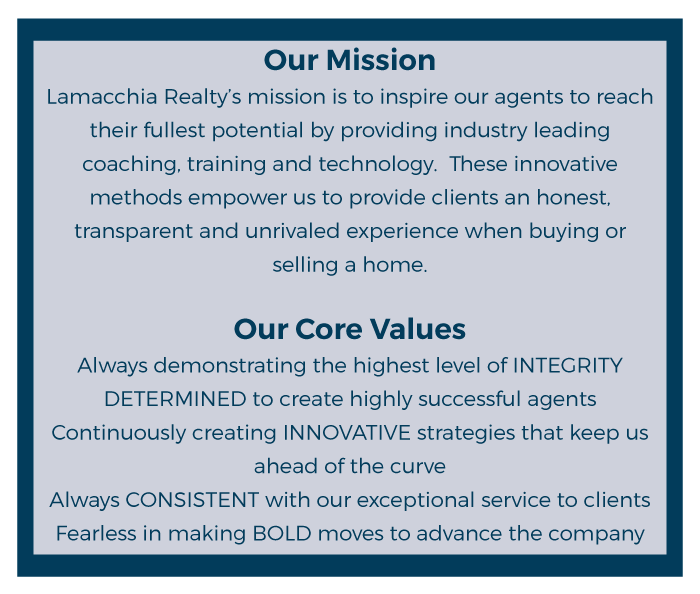 Lamacchia Realty was originally a company that was built on a power team model, but over the last two years, the company has transitioned to a more traditional brokerage model with a lot more benefits for agents than any other brokerage in New England. Since there are so many moving parts in a real estate transaction we have become a very process driven company. Now that we have sold thousands of homes we have checks and balances for everything to help the agents with their sales because we know that nothing can be left to chance. Our Company Mission Statement and Core Values best describe what is most important to us and our goals for the future. The Boston Business Journal honored Lamacchia Realty in their Pacesetters list of fastest growing companies in Massachusetts in 2013, 2014 and 2015. Inc 500 has recognized Lamacchia Realty as one of the fastest growing companies in New England for 5 years in a row. In addition, Lamacchia Realty has been ranked in the Top 1000 list of real estate companies in America by REAL Trends for 6 years in a row. To drastically increase your Real Estate business, Click Here! give us a call at 800-924-6563.